Is Paradise Island really a paradise? That, of course, depends on your perception of paradise. We needed to see it for ourselves and share our findings with you. So what is Paradise Island? Formerly known as Hog Island, it was bought by a South African hotel giant: Sun International. They quickly realized that probably no one was coming to frolic on the sun at Hog Island and changed it to “Paradise”. 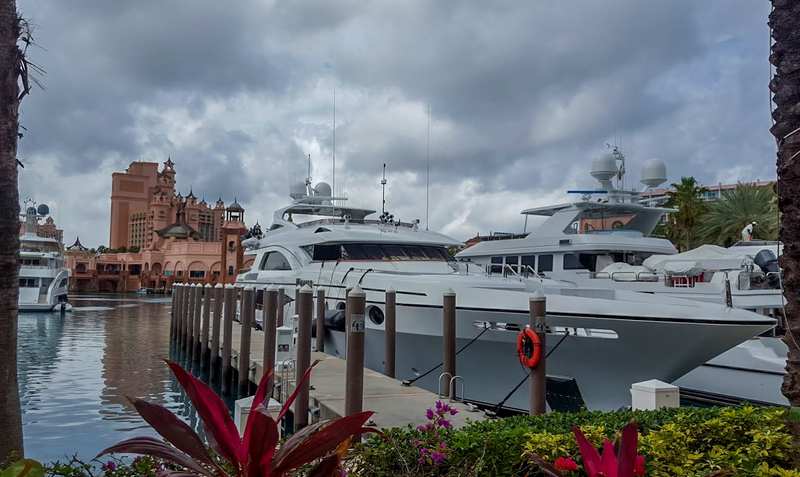 Some big bucks were thrown into its development and now it houses of the one of the most known and iconic resorts in the world, Atlantis. Everything is over the top and extremely expensive from restaurants, water park to shopping. This is not a place to visit if you are on a budget. If taking time off work to shop is your type of relaxation, then Paradise Island has a plenty of options. Outside of the sprawling resort there is the Marina Village. A mere 10 min ferry ride to Nassau, offers traditional fare at Straw market. Really good for those wooden souvenirs everyone brings back from their Caribbean vacations. 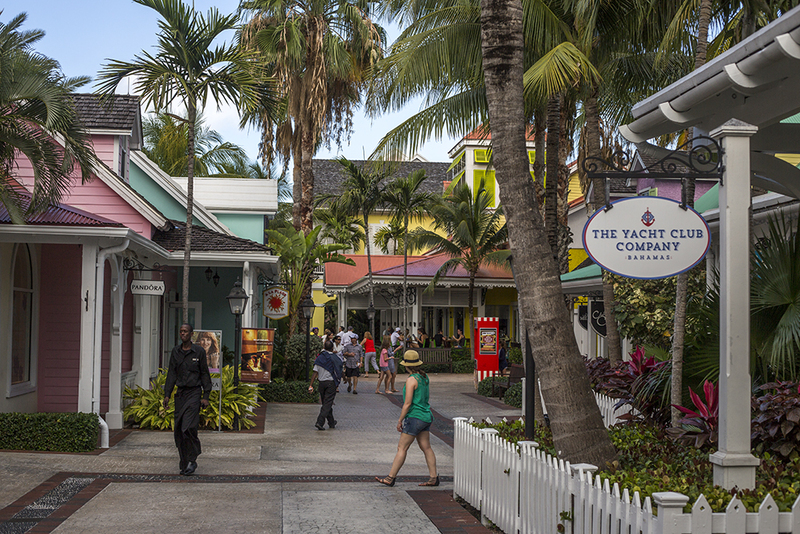 If you go into the Atlantis resort, the shopping evolves into traditional shopping mall experience. You want Cartier or Rolex? They are conveniently located right next to the casino. In fact, all the expensive stores are next to the casino so that you can blow your winnings in a hurry. 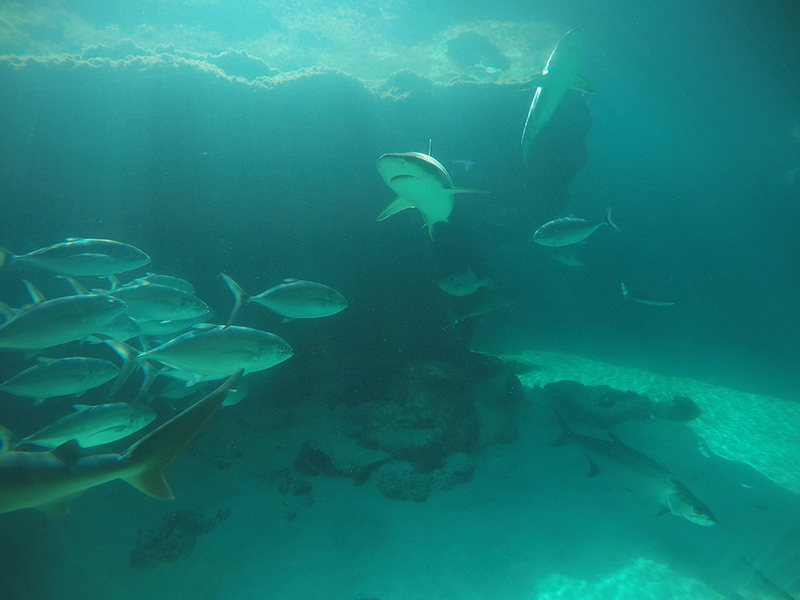 For those who had no luck, Atlantis offers a soothing ambiance of a massive aquarium to look at. If shopping and sun lounging is not thing, there are plenty of activities to be done on the beach. Private vendors will entice you with parasailing, jet skis and of course snorkeling. Speaking of snorkeling, you have lots of options with varying degree of expenses. 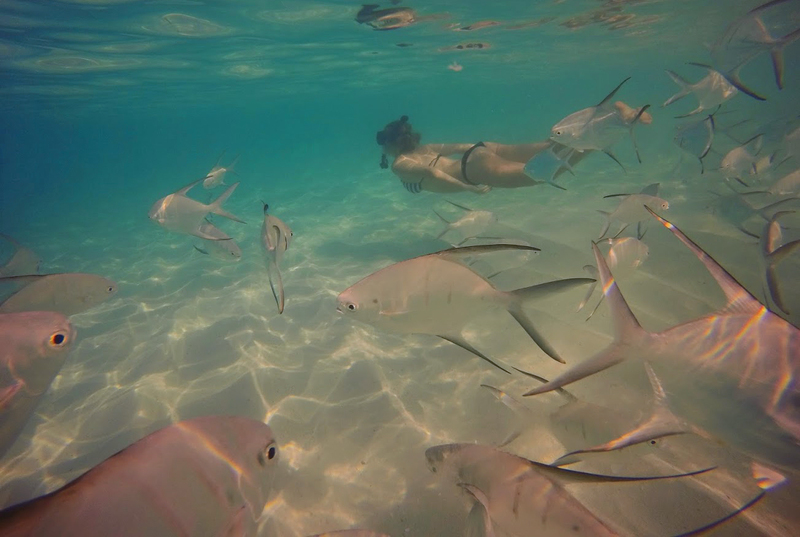 You can snorkel among Atlantis ruins amidst some of the most colorful fish in the world and pay a hefty price to do it or you can take some bread and bring it to the beach. In seconds, you will be surrounded by schools of hungry fish. Can’t buy memories like that! Oh yeah, it is totally free too. Some cruise ships sell passes and the rest buy them at the resort. You have to access the Coral towers. There are stairs right across the check in/out counter and you have to head down. The passes cost around $150 per adult and $80 for kids 4-12. Get there early as they sell out and if the resort is full, they do not sell day passes. Best of two worlds can be achieved if you choose to stay at Riu next door to Atlantis. It is an all inclusive resort with the same beach as Atlantis. You can buy the day pass, go crazy on all the slides and then walk back to your hotel, have lunch for free and then go back to the water park. It is a lot cheaper than buying burgers and pizza at the waterpark. The water park is not the only attraction in Atlantis. 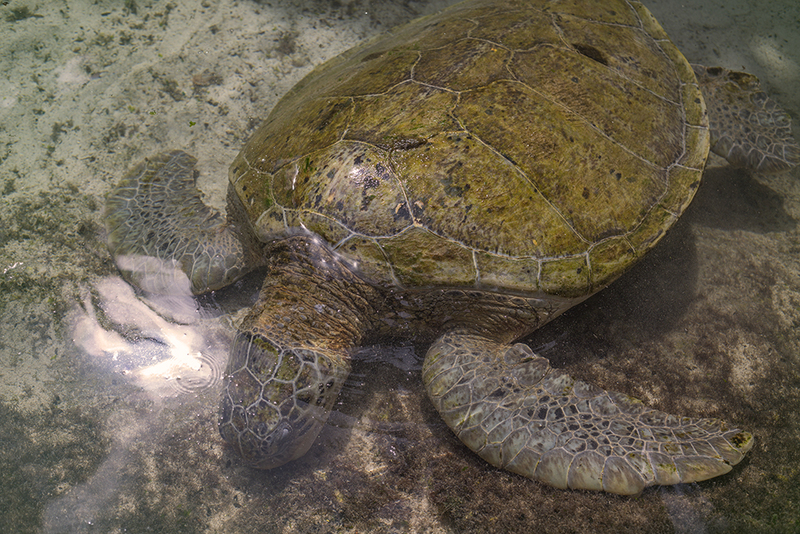 The resort works to rehabilitate marine wildlife to our delight, every lagoon had sharks, rays and turtles swimming. 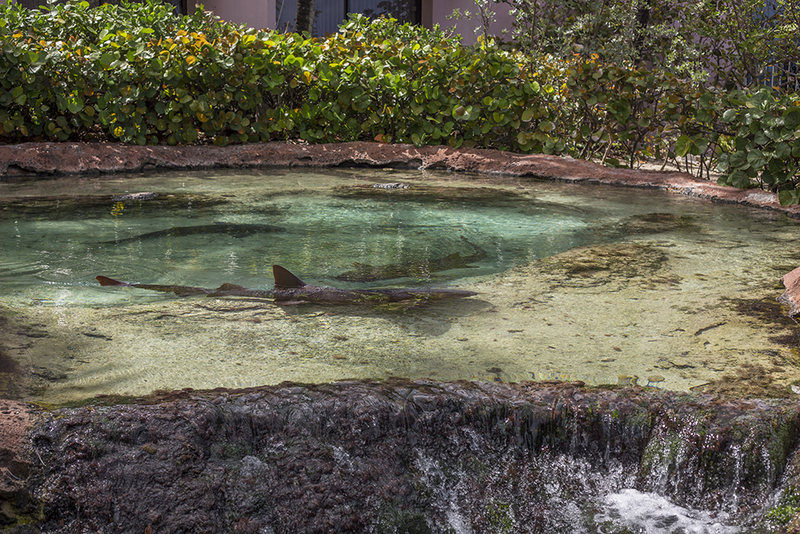 There is even a large pond with two huge hammerhead sharks gliding below you. Activities include: petting stingrays, swimming with sharks and being a dolphin trainer. You can’t pet sharks though. Personally for us, the aquarium was the highlight of our visit. You absolutely have to visit the “Dig”. It is completely free to experience. The intricate details of lost city of Atlantis have been carefully noted. It is easy to lose your bearings and forget where you are once you descend below.. As you are walking along dimly lit passage ways with ambient music soothing your ears, the whole experience of the aquarium takes you to another level. A fantastic place to bring the kids for the whole day. There are moray eels, piranhas, groupers and even a touch interaction tank with conch and starfish. 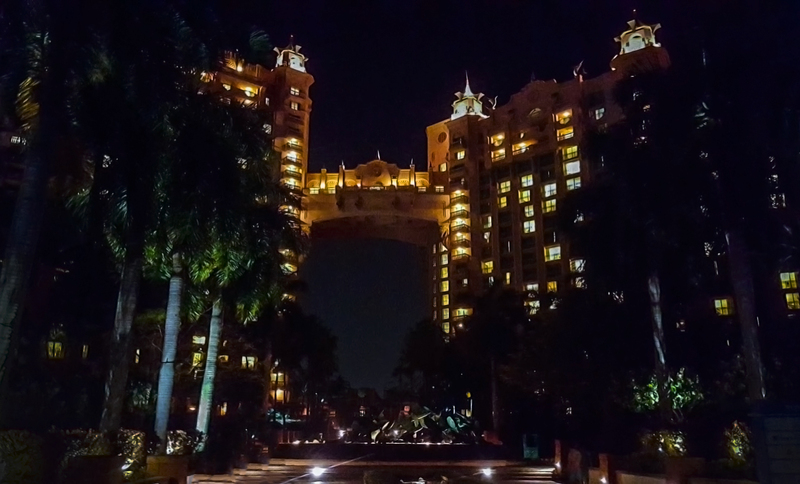 The highlight of Paradise Island is certainly Atlantis resort. A sprawling hotel that resembles more a city than a resort. Amenities include a massive water park, golf course, private beaches and 35 restaurants. Most of the people that stay at Atlantis do not even venture outside its gates simply because all they could desire is available there. Did you know that you can spend a night in one of the most expensive hotel rooms in the world? Check out the Bridge suites. At $25000 a night, you can spend a day living in late Michael Jackson’s old residence. Some might use that money to put a down payment on a house, some might get an education or you can stay here for 21 hours and feel like the king of pop.